Danielle Daws: Just Add Critters! The challenge at Just Add Ink this week is Just Add Critters! That means bugs, animals, creepy-crawlies... that kind of thing. Check out the DT inspirations here. The card I have to share is so very, very simple! It's also inspired by the challenge at Simplicity - OLW31, Back to the Beginning, which is to go back to your beginnings in rubber stamping and make a one-layer card that uses a technique or product that got you hooked. From the very beginning, I've loved using multiple colours on one stamp. I'd love to know what you think... is it too simple?? I really, really love this! So cute. Not too simple at all. Often less is more. Cograts on being in the spotlight over at There She Goes today! I love it danielle.I find it just as inspiring as all your other cards. You are the person who got me to use my prisma pencils for the first time even though i had had them for a year. This card is simply beautiful. Not too simple - this is just precious! Love it. This is just super - not too simple at all!! I love the brightness of the Ladybugs!! This is SO cute! Not too simple at all! Love the ladybugs. I also like to ink up a stamp with multiple colors. There's no such thing as too simple and this card is absolutely gorgeous! It is not TOO simple. It is perfect! Stunning actually! 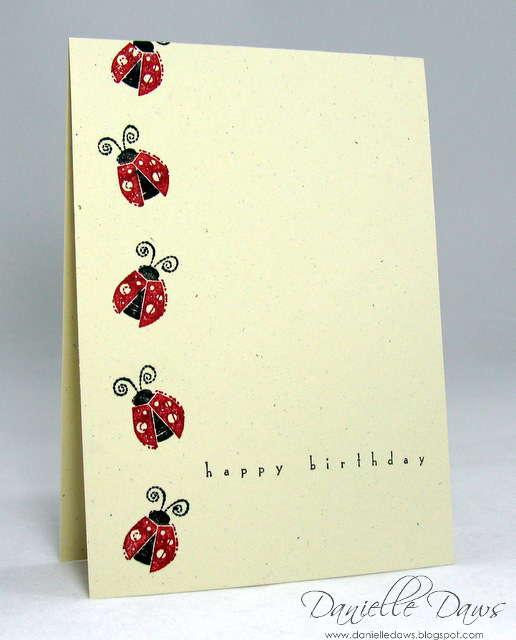 love love love those little bugs, that card is super cute, I love it, and any more would have looked too much! Those lady bugs look almost real!! Love the simplicity!